“I’m thrilled to congratulate the newest cohort of young people who have been accepted into our academic community,” says Emory President Claire E. Sterk. “Their accomplishments are extraordinarily impressive. But what inspires me the most are their dreams for the future. Ready to welcome you: It&apos;s a tradition at Emory that President Sterk (center) and other university leaders join the hundreds of volunteers who help first-year students unload bins full of luggage on Move-In Day. Along with the growth in application numbers, admission officers saw an increase in the number of students with high academic achievements and who embody Emory’s values of innovation and leadership both inside the classroom and in their communities. “I could not be more pleased that Emory University’s thriving academic community will be joined by this brilliant, engaged and diverse Class of 2023,” says Dwight A. McBride, provost and executive vice president for academic affairs. Emory University offers two starting points for prospective first-year students: They may apply to Emory College of Arts and Sciences on the Atlanta campus or to study for their first two years at Oxford College on Emory’s original campus in Oxford, Georgia. After the sophomore year, all students choose to complete their undergraduate degree on the Atlanta campus through Emory College, the Goizueta Business School or the Nell Hodgson Woodruff School of Nursing. This year Emory College offered admission to 4,512 students, a 15 percent admission rate. Oxford College admitted 3,432 students, a 19 percent admission rate. Approximately 17,500 students applied to both campuses. Admitted students have typically chosen a challenging pathway through their high schools. They are often involved in one or more activities that bring meaning to their lives and to the lives of those around them. These are students who are smart and engaged, and they are “intently at work preparing to contribute in some way to their world,” says John Latting, associate vice provost for enrollment and dean of admission. 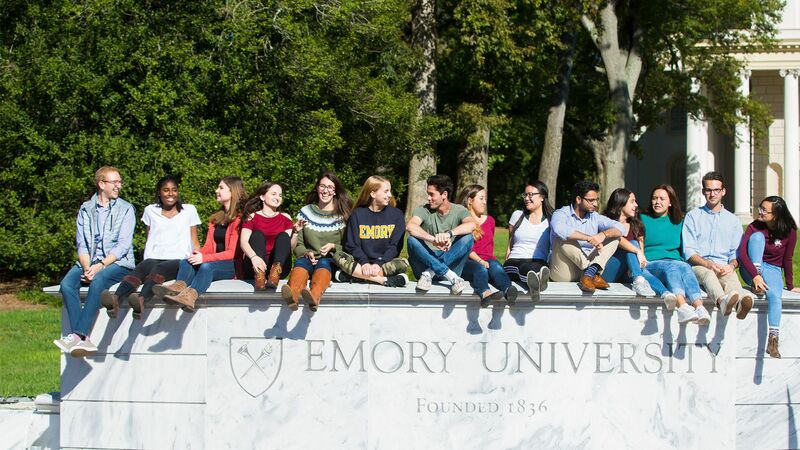 This year’s admitted class continues to support Emory’s emphasis on strong academic preparation. For instance, the median test score for students admitted to Emory College was 1500 on the SAT, meaning half of them were above a score considered in the 99th percentile nationally. The median unweighted high school GPA of admitted students was 3.92, meaning most admitted students made all As or nearly all As in high school, while pursuing the academic opportunities available in their schools. “The students we admit have shown that they really care about learning, that they learn well, and that they make use of the opportunities they’ve had,” Latting says. They come from 49 states (missing Montana), as well as Washington, D.C., Puerto Rico, Guam, the Virgin Islands and Mariana Islands. They represent 106 countries by citizenship (note there are 195 countries in the world). In addition to being highly proficient in English, they speak 80 other languages either at home or as a first language. 442 students are the first in their families to attend a four-year college or university. 32 percent come from an under-represented or minority group. They attend 2,562 high schools around the world. You&apos;re In! Emory offers both Early Decision and Regular Decision options for undergraduate applications. Watch as Early Decision students react to learning that they will be first students in Emory&apos;s Class of 2023. 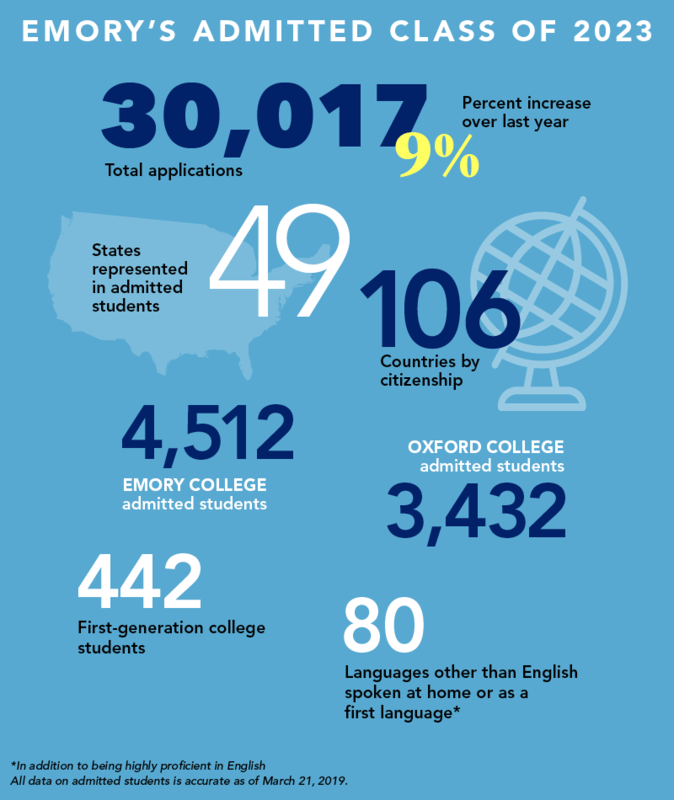 The increase in both the achievements and diversity of admitted students is thrilling for leaders at Emory College and Oxford College alike. "The Class of 2023 is an exceptional set of students selected from the largest applicant pool in the history of Emory College. I can&apos;t wait to welcome them this fall and watch their careers unfold on our campus," says Emory College Dean Michael A. Elliott. Emory’s reputation for challenging academics that go hand-in-hand with serving society make it an excellent choice for students who want to use their education, skills and experience to change the way we live in the world. The Office of Admission extends these values into the application review process. Each application, regardless of the student’s test scores or grade point average, is reviewed by a committee of at least two admission officers, who look at all parts of the application. Often, a single student’s application is reviewed by different committees and many more officers before a final decision is made. We&apos;re excited, too: See the moment when President Sterk pushes the symbolic button and Emory&apos;s admission staff celebrates as acceptance notifications go out to Regular Decision applicants around the world, completing the admitted Class of 2023. Along with an application, high school grades and standardized test scores, applicants must submit an essay, two short-answer questions, and at least three letters of recommendation from educators. “I’m excited about our process and the reasons Emory admits students. We continue to affirm that this is about the person, going beyond only looking at test scores or grades. We do our best to identify students who will make the most of the academic and other opportunities Emory has, and I believe the group of students we admit is incredibly talented, engaged and diverse in a way that is hard to find anywhere else,” Latting says. Emory University meets 100 percent of demonstrated financial need for all domestic students, including American citizens, permanent residents and undocumented students. Whether a student applied under an Early Decision plan (that comes with a binding agreement) or Regular Decision, they will receive the same amount of aid in their financial aid package. Currently 58 percent of all Emory University undergraduate students receive some kind of financial aid. Packages can include a range of grants (money that does not have to be repaid), loans (money that does have to be repaid) and work-study opportunities. Additionally, 21 percent of current first-year students are eligible for Pell grants. Pell grants, a federal government education grant, are most often awarded to students whose families make less than $30,000 annually. Some Pell grants are awarded to students whose families make $30,000 to $60,000 annually. The university expects to be on track with similar numbers for the coming year’s class. Emory also offers programs focused on low- to middle-income families, including Emory Advantage, which limits the amount of loans a family must take on if they make $100,000 or less, annually. Both federal programs, such as the Pell Grant, and Emory programs, such as Emory Advantage, aim to ensure that the financial burden that can come with college doesn’t limit students’ post-graduation plans. Regular decision notifications were released March 20 through applicant portals. Admitted students have until May 1 to decide to enroll. "Because I Chose Emory": Current first- and second-year students describe their experiences as students at Oxford College and Emory College of Arts & Sciences. Application numbers are taken one week after the application deadline. All data on admitted students is accurate as of March 21, 2019. Written by Lisa Coetzee. Photos and video by Ann Borden, Kay Hinton, Stephen Nowland and Corey Broman-Fulks. Infographic by Gordon Boice. Design by Laura Douglas-Brown.